Published: Jan. 10, 2019 at 04:11 p.m. Updated: Jan. 10, 2019 at 04:18 p.m.
Drew Brees has never lost a playoff game in New Orleans, Nick Foles is looking for another miracle run for the Lombardi, and the Chiefs are seeking playoff redemption against the Colts. See what the numbers have to say with these mind-boggling stats for the Divisional Round. 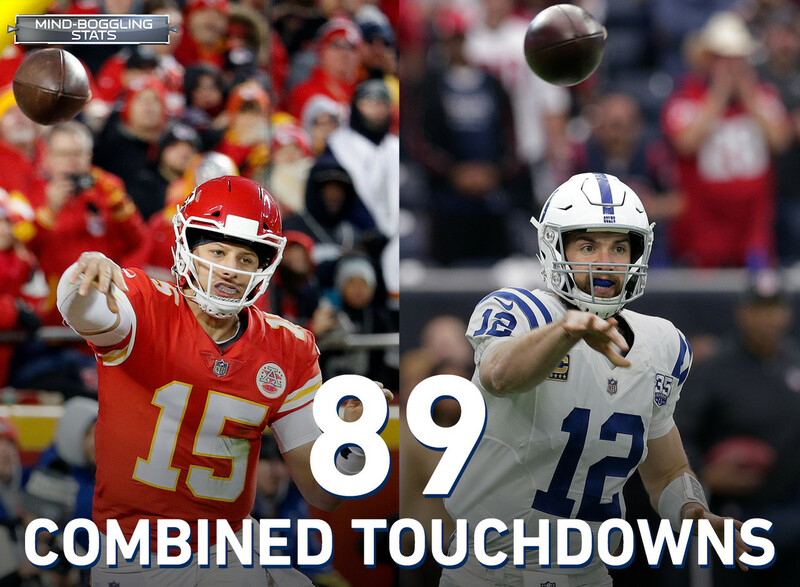 Patrick Mahomes (50) and Andrew Luck (39) have combined for the most regular-season passing TDs (89) among any opposing quarterbacks in a playoff game in NFL history. Mahomes and Luck will pass Peyton Manning/Philip Rivers (87) in the 2013 Divisional Round and Drew Brees/Matthew Stafford (87) in the 2011 Wild Card. Drew Brees has never lost a home playoff game in New Orleans in his career, as he is 5-0 heading into Sunday's matchup with the Eagles. How rare of a feat is that? Brees is the only QB in the Super Bowl era with 5+ home wins and zero home losses in the postseason. Philip Rivers and Tom Brady will be the third pair of opposing playoff quarterbacks with at least 50,000 career passing yards (entering the game). The others: Peyton Manning vs Brady in the 2013 AFC Championship Game, and Hall of Famers Dan Marino vs John Elway in the 1998 Divisional Round. Does defense win championships? The Dallas Cowboys sure hope so, as they have the best remaining scoring and total defense but the worst remaining scoring and total offense in the playoffs. The Cowboys take on the Rams' #2 ranked scoring offense Saturday, a task the defense has handled well: the Dallas defense has allowed the second-fewest PPG (16.5) and the fewest total YPG (273.0) to Top 5 scoring offenses this season (Min. two games). The Eagles might want to read up on the 2010 Jets heading into Sunday's matchup. Those Jets were the only team in NFL history to lose to an opponent (the Patriots) by 40+ points in the regular season and then beat that same opponent in the playoffs. They are also the last 6th seed to win a Divisional Round playoff game. With eight road wins (including playoffs) and a "home" win in London, the Chargers are the eighth team since the 1970 merger to win at least nine games outside of their home stadium in a season. The previous seven teams – including the 2016 Patriots most recently – all won the Super Bowl that season. It has been a tale of two seasons for Dak Prescott and Jared Goff. Through the first 11 weeks of the season, Goff was the NFL's third-highest rated passer (113.5), while Prescott (90.3) ranked 23rd in the NFL. Through the final six weeks of the season (Weeks 12-17), Prescott was the NFL's fourth-highest rated passer (105.9), while Goff (74.8) ranked 25th in that span. Nick Foles currently sports a 4-1 career record in the playoffs. With a win on Sunday, he would raise his win pct to .833, tying Trent Dilfer for the best by any QB with 5+ playoff starts since the NFL merger. Philip Rivers and Tom Brady's last head-to-head meeting in the postseason was the 2007 AFC Championship Game. The 4,011 days between that game and this Sunday's AFC Divisional Round matchup is the second-longest span of days between postseason meetings among two quarterbacks. The only longer span was the 4,382-day span between Ben Roethlisberger and Brady meeting in the 2004 and 2016 AFC Championship Games (both won by Brady). No NFL player has more rush yards (4,547) or scrimmage yards (6,430) than Todd Gurley since he was drafted in 2015, but the same can be said for Ezekiel Elliott. Elliott has the most rush yards (4,048) and scrimmage yards (5,247) since being drafted in 2016. This head-to-head matchup will be the first playoff game since 1970 to feature two players who each lead the NFL in rush yards and scrimmage yards since the season in which they were drafted. If you rolled all four active Eagles running backs into a single player, they still wouldn't be as productive as Alvin Kamara was this year. Josh Adams, Wendell Smallwood, Darren Sproles, and Boston Scott combined for 1,443 scrimmage yards and 11 scrimmage touchdowns in the regular season ... Kamara totaled 1,592 yards and 18 TDs on his own.